All you need is $50 to go on a bike trip around South Korea for several days. Transit. Accommodation. Food. Everything. And biking on a budget in Korea doesn’t necessarily mean cookies and instant coffee for breakfast every day of your trip. Though, I’m not opposed to the idea. 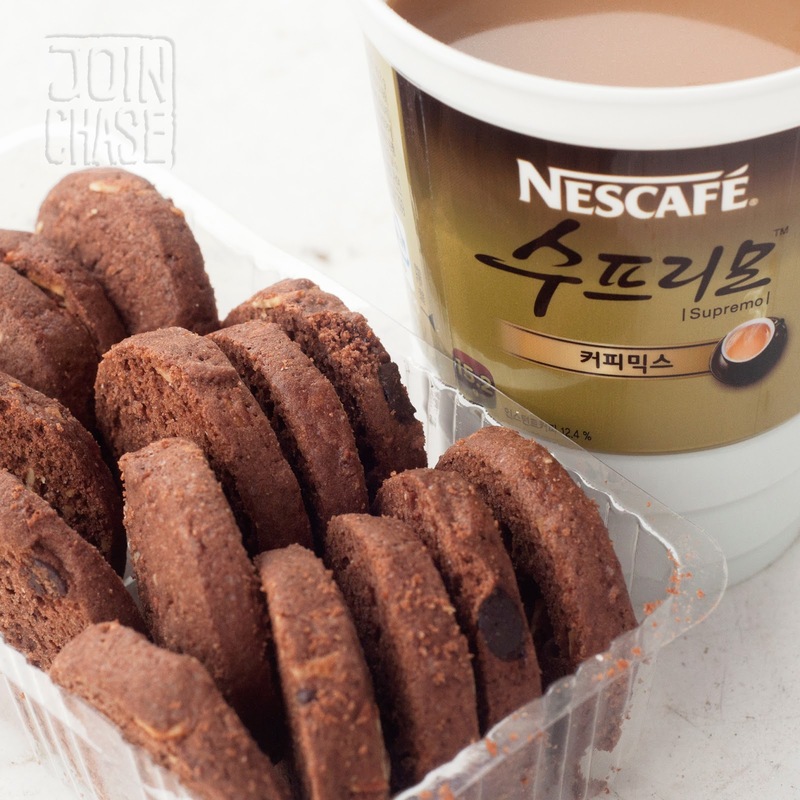 Even if I had enough money to eat a normal, healthy breakfast, I’d probably still go for cookies and coffee from a convenience store instead. It’s February in South Korea. That means it’s cold. Snow is probably on the ground in most places. Cherry blossoms are still weeks away from blooming before summer slaps them off their branches with hot and humid force. By this time last year; however, I was already on the trails. What are you waiting for? Start riding! But, if you don’t have enough layers to brave the cold, or if bike paths in your area haven’t thawed out yet, hopefully this post helps you prepare for your upcoming biking adventures. I’ve biked all four of the major river trails in Korea. Some take longer than others. A budget of $50 works best for the shorter rides such as the Geumgang and Yeongsangang paths, or the portion of the Han River Trail from Paldang Station (Seoul) to Chungju Dam. It took two days and one night (of rest) to complete the Geumgang Trail. It would take about the same amount of time to bike from Paldang Station, on the outskirts of Seoul, to Chungju Dam and back. I also took two days of biking, and one night of rest to do the Yeongsangang Trail. The trip from Seoul (or Incheon) to Busan lasts about five days. Doing the trail in three or four days is possible, but why not take your time and soak up some sun, scenery, and Korean culture as you’re cutting through countryside? Suggested items to pack for biking around South Korea on a budget. August, 2013. If you don’t have proper biking apparel, swimming trunks work really well for men. I’m assuming an appropriate bathing suit would work just as well for women. Why? If it rains, you’re ready. You’re going to sweat no matter what. Swimming attire dries quickly, and is easy to wash. Plus, if you want to take a dip in a stream along the way, you don’t have to change. Another reason I like to wear swimming trunks is because they usually have a built-in, mesh lining, which means I don’t have to pack as much underwear. Two lightweight shirts, and one extra pair of shorts is all I bring in addition to swimming trunks, a pair of underwear, and a couple pairs of socks. Bring some nonperishable food items to help cut back on the cost of eating out. Have at least one authentic Korean meal per day, and then snack the rest of the way. Having a stash of snacks in case of an emergency is reassuring. 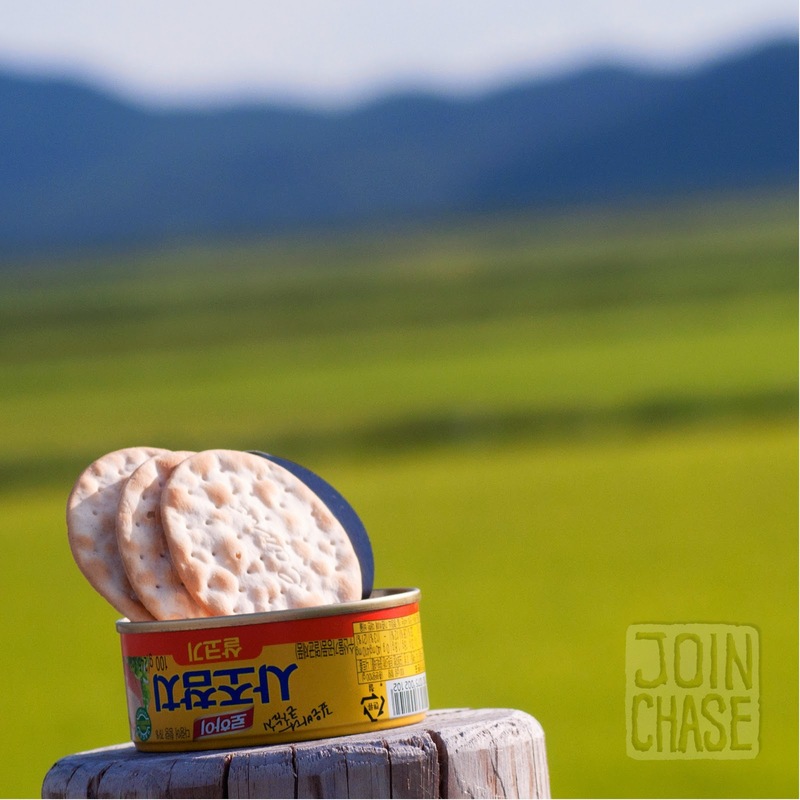 Cans of tuna, a small jar of peanut butter, nuts, and crackers are my preferred munch-able companions. Instant oatmeal works really well, too. Don’t forget sunscreen, unless you want a tan. And make sure your arms and hands are covered. The heat and sun are extreme during the summer months in South Korea. Protective eyewear like sunglasses is absolutely necessary as well. To shield your eyes from the sun, and to keep swarms of insects out. Ensure you have an extra tire tube, an air pump (you can find stationary ones along the trails), and lubrication/oil for your chain, gears, and pedals. I need mints. And mouthwash. Those are my guilty, somewhat unnecessary pleasures. Packets of instant coffee, as excessive as it sounds, are also kind of a personal necessity. What are you going to do when you're in the middle of nowhere, or on top of mountain with no Caffe Bene in sight? Camera equipment is essential for me. It takes up the most space, and is my heaviest gear, but being able to document my rides is well worth the sacrifice it takes to lug around a DSLR with a few lenses. A phone with music, or an additional song source is definitely recommended. 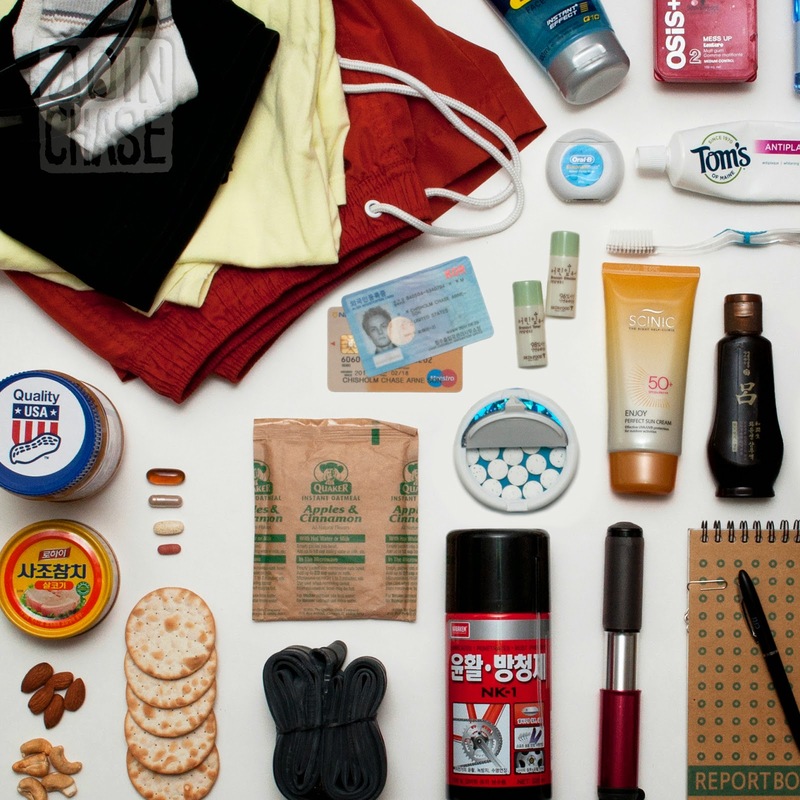 Packing some small toiletry items if you don’t plan on staying in a hostel is a good idea. I take along herbal supplements, vitamins, and painkillers. Ibuprofen is my friend on the trail. A notebook for jotting down your amazing adventures as they happen is nice. If you want to camp along the trail, make sure to strap a small sleeping bag or blanket to your bike. Extra clothes can be used as a pillow if you don’t have a small, inflatable, travel-sized one. Lastly, be sure to have some form of identification, as well as a small amount of cash and/or debit card. I bring my budget in cash, and an ATM card in case I need more money. Shove it all in a backpack, and rig it to your bike. A small rack attached to the back of a bike works well. Use bungee straps to secure your baggage to the rack. It isn’t fun to ride long distances with a bag on your back. 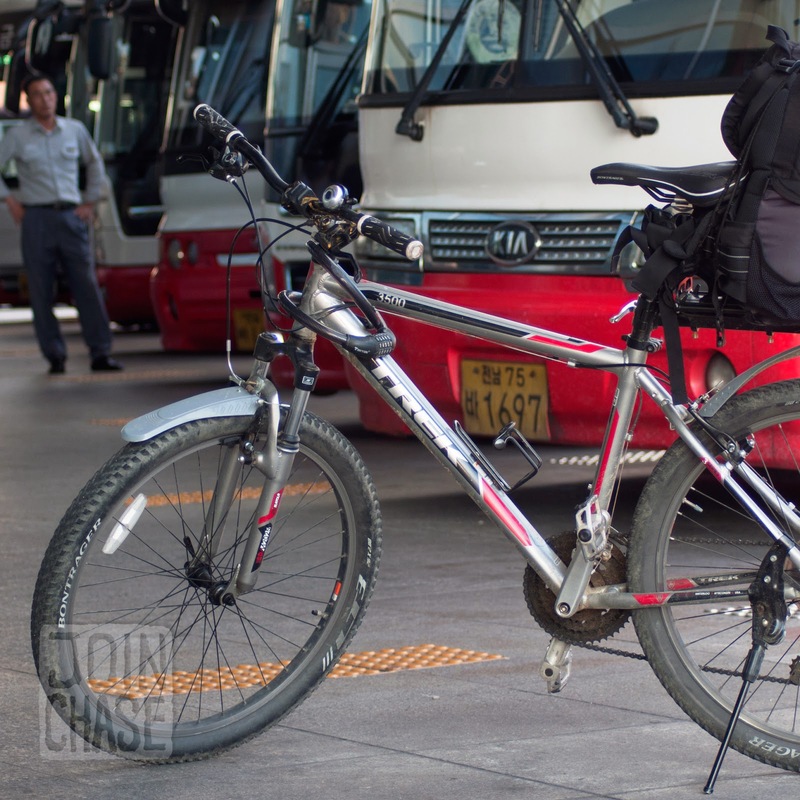 Traveling with a bike using public buses in Korea. Gwangju, South Korea. August, 2013. Putting a bike under a bus in South Korea. August, 2013. After you’ve packed, and you’re all ready to go, you’ll need to get to where a trail starts. 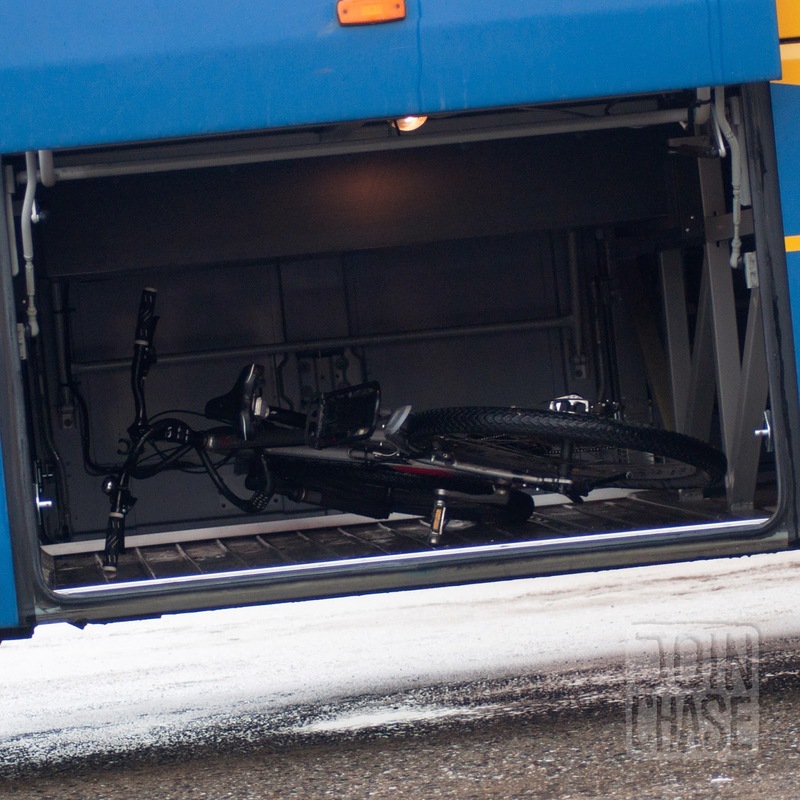 If you don’t live close enough to connect by bike, putting your bike under a bus is an option. It’s possible to transport a bike on commuter trains as well; however, you have to put it in a proper bicycle bag. I generally take a bus to the start of a trail, and then bus-it home after completing a ride. Depending on how far you live from the point you start and/or disembark will obviously impact your budget. But, for the most part, public transportation in Korea is very affordable. Check out this gorgeous PDF put together by Korea Tourism Organization for a fantastic cycling resource. It includes maps, photos, and various other information about biking trails throughout South Korea. The official website for Korea's riverside trails seems to be under construction at the moment. I usually use these online guides to help figure out how to travel to and from each trail. Bike lockers sponsored by Korea Tourism Organization outside Samjeong Youth Hostel in Buyeo, South Korea. There are designated campsites on most riverside trails in Korea. Some trails seem to have more than others, or simply more that are clearly marked/closer to the path. The campsites I’ve found are awesome. What I mean by campsites is wooden deck-like structures raised off the ground, not grassy spots. They’re free (at least the places I’ve perched a tent), and nearby restroom facilities are usually available. If you really want a shower and bed, look for cheap motels in nearby towns. If you happen to be close to a bigger city, you might even find hostels such as Hostelling International's location in Buyeo, just off the Geumgang path. I paid about $14 for my own room with air conditioning, a hot shower, and plenty of cushions and pillows to sleep with. 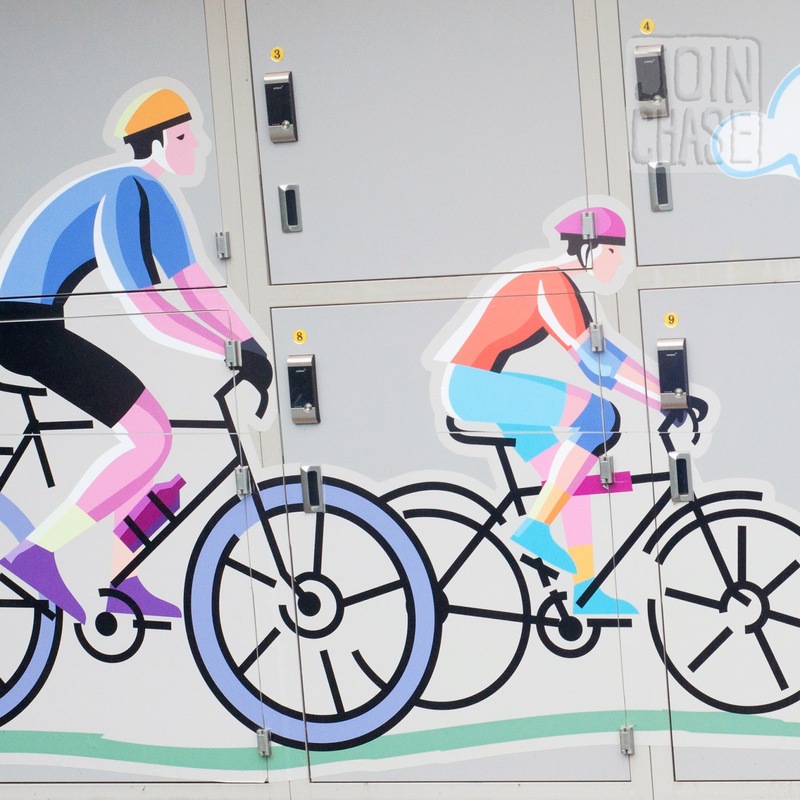 The place even had official Korea Tourism Organization bike lockers. I replenished my drinking water supply for free, and used the hostel’s hot water to make instant oatmeal for breakfast in the morning. It was a budget-biker's paradise. Taking a vacation doesn’t have to be expensive. Sometimes not having a lot of money for a trip forces you to be creative, resourceful, and usually makes traveling a lot more adventurous. On all of my trips so far, I’ve spent most of my limited budget on transportation getting to and/or from a trail. As long as you have enough money to get a bus back, you’ll be fine. Street food and treats from convenience stores (in most cities) are relatively inexpensive. But, you won’t need to splurge if you pack snacks. Unless you plan to stay in the VIP room of some “love motel” along the way, accommodation is cheap, or even free if you camp. Staying with a friend is always an option too, if you happen to know someone living in the area you'll be passing through. Even if you’re financially able to spend as much money as you want, challenge yourself to bike on a budget in South Korea. The spectacular views you’ll see are free, and the memories you'll gain are, of course, priceless.